McClung works on his designs from his home studio. 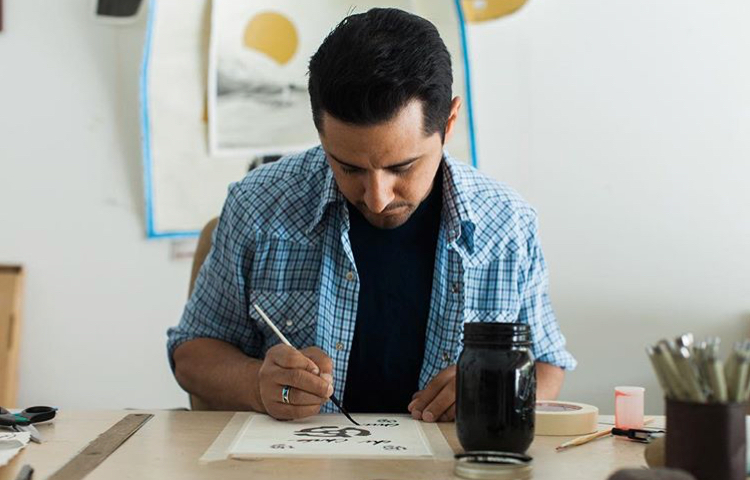 James McClung is a visual artist based in Redlands who has made a positive impact on the community with his gallery pieces, murals and logo designs for various businesses. McClung is 36 years old and had been drawing and painting for as long as he can remember. Growing up, his family and friends supported his art as both a hobby and passion. He had worked day jobs, such as a server at the restaurant, Time in a Bottle, to support his artwork. In 2015, he grew tired of doing both and decided to pursue his art full-time, which McClung admits was a rough transition. “Last September was the last month I worked as a freelance artist. So, I was just picking up jobs here and there. I did that for almost three years and it was tough,” McClung said. While McClung worked freelance, he developed relationships with various community members including business owners who took interest in his work. Currently, McClung works full-time for businesses such as Parliament Chocolate and à la Minute ice cream. He creates all of their merchandise designs, logos, and websites. 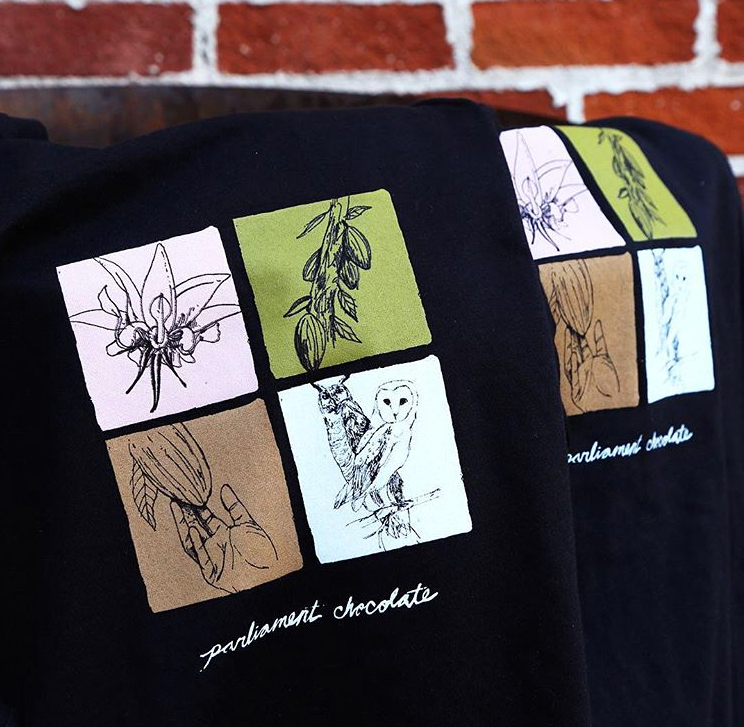 Parliament Chocolate is located in historic downtown Redlands. Some designs for each shop include simple line drawings of different animals and plant life. As for logos, he focuses on the typography with an image. The most popular designs he created for Parliament Chocolate are on their candy wrappers. The word Parliament is styled as strong three-dimensional letters that appear as they’re from the 1920’s Prohibition Era, and a different type of owl is illustrated to suit each chocolate bar. “My favorite commissioned project would have to be Parliament Chocolate, which is continuing to this day. I am grateful to be a part of that team,” McClung said. In addition, McClung has created commissioned pieces for other businesses in the area such as Cheesewalla, Augie’s coffee, and The State Bar and Kitchen. He’s created merchandise designs for all businesses and has painted murals on their walls. Cheesewalla’s McClung mural is possibly the most seen by the community, as it is displayed in a newly remodeled alleyway that attracts visitors from all around the Inland Empire. McClung not only plays a pivotal role in the community, but his talents have also been recognized by larger companies such as Stereo Skateboards, owned by actor Jason Lee and Professional Skateboarder Chris Pastras. Lee recognized his work through Instagram when a friend of both Lee and McClung were looking at his page. From then on, Lee showed interest in McClung’s work asking to purchase his original pieces, and soon after offering him the opportunity to design a skateboard for Stereo at an art show they attended in Long Beach. Skateboarding has always been a part of McClung’s life, so he was thrilled to be offered such a dream opportunity. McClung describes Lee as a warm and friendly person and expressed that he was proactive in getting McClung involved in the project. McClung’s designs are heavily influenced by scene from his travels. 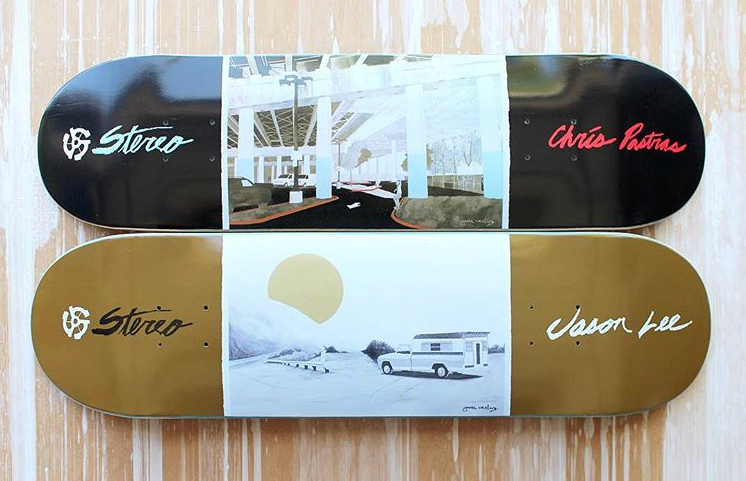 “As soon as I walked in the door Jason Lee turned to Chris Pastras and said they should have me create a board, and Chris Pastras agreed. I was just like, what’s happening right now? This is really happening the first thirty seconds I walk in the door,” McClung said. A year later, Stereo released the boards McClung had created for their company. One board was for Lee and one was for Pastras. Both boards featured landscape photographs they had taken that were recreated as illustrations by McClung. McClung has the boards hung on his wall at home. Most of McClung’s work is mixed media, encompassing ink, paint, pen and apache colors. He works on various types of paper, canvas, and wood. His main focus in all of his pieces regardless of the content is to communicate his emotion through the use of colors, bold geometric shapes, and lines. One piece of his work that demonstrates this is titled Bennet Rested. The piece portrays a camper van painted in black and white ink in the middle of the desert. In the background of the van sets the sun which is painted bright orange and has beside it two large mustard yellow triangles that seem to point directly at the sun. The shapes bring attention to the camper van and create the idea that it is beautiful in its solitude. Other pieces of his include more landscapes and scenes of people in the city. All of his work provides delicate lines and bright colors that leave his audience feeling inspired to see more of the world. McClung draws inspiration from cities all over the nation such as Joshua Tree, Calif., New York City, N.Y., and Austin, Texas. The life and culture of different places around the nation provide him with endless creative ideas and scenery to use as a reference for drawings. Over the last year, he has been exploring rural areas as well as large cities and experimenting with photography to capture the energy of each place he visits. After venturing out to other places, he works from his garage transformed studio, to produce his masterpieces. “A City Like Jazz” captures the lively energy New York City has to offer. Last summer, McClung had two major art shows. This first was be held on June 7 at Kate Oh Gallery in New York, N.Y. 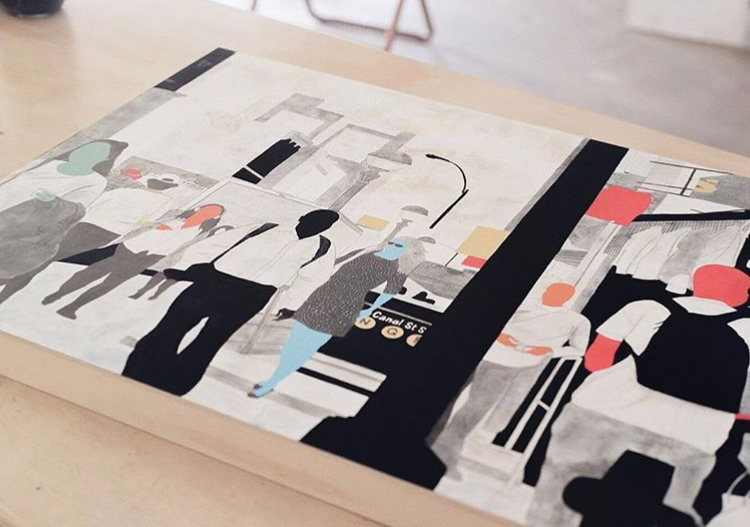 This show featured his series entitled A City Like Jazz, alongside the work of artist Kyp Malone. “This collection draws inspirations from all the different characters that collectively make up New York City. The buildings, the street life, and the vast array of people one encounters on a daily basis,” McClung said. The second show was in July and hosted in Austin, Texas by Preacher Gallery. It was entitled Low Land – scenes from the American southwest. The show was a collaboration of photography and paintings by McClung and friend Dusty Ferguson. “This show is very personal for me, it’s something I really wanted to do and made happen. I had a lot of fun discovering places to recreate for this show, and it’s something about these rural areas that speak to me,” McClung said. McClung is still traveling and working on pieces inspired by his experiences in other places and the people around him. He plans to keep working and maintaining relationships so he can continue creating for a living.